2016 has been a horrible year. Brexit. Trump. And the death list of Bowie, Prince, Keith Emerson, Greg Lake, Leonard Cohen, Glen Frey, Rick Parfitt, Christina Grimmie, Chyna, Alan Rickman, Victoria Wood, Gene Wilder, Kenny Baker, Robert Vaughn... 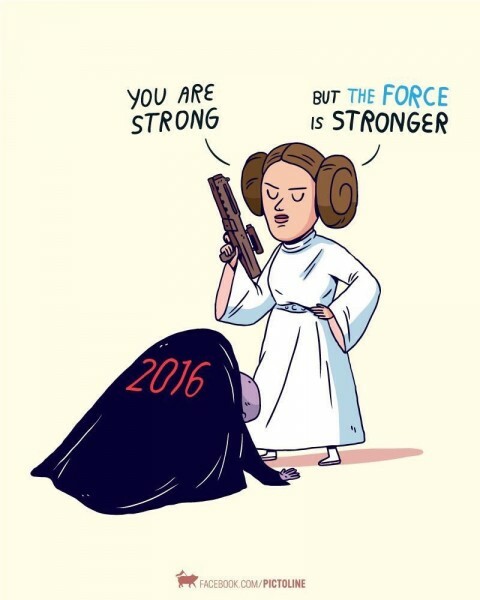 I have my fingers crossed for Carrie Fisher. Music this year has hit a new low; other than Passenger and Christine and the Queens everything I've heard has been appalling. And Louise didn't win Strictly. But at long last there has been something to smile about. The Last Dragonslayer on Sky 1. Very much in the same style as their adaptations of Terry Pratchett's works but better (and blessedly free of David Jason). Jennifer Strange is my new heroine. Rick Parfitt died on xmas eve to add to the list. I already had Rick Parfitt on my list. And George Michael has just died. There's going to be one hell of a concert in Heaven on New Year's Day. Just double-checked; must have missed it before. Have no idea who Louise is, or what Strictly is for that matter. And I've heard some incredible new music this year, but I tend not to follow what's in the charts; not that they've beem relevant for the last quarter century or more. Saw that icon; no idea what the show is; only interested in anything via Rupert Murdoch if I can restrict my access to channels showing MLB/NHL/NWSL etc... Have been thinking of re-working a story I wrote an outline back when there were only three UK telly channels to fit into a Buffyverse scenario. Couldn;t watch the Sense* xmas special since I had not the funds to use up my data on watching Netflix. Still waiting for a chance to watch Luke Cage, adn hoping someone gets The Man in the High Castle online for long enough for me to get the 2nd season - Amazon are a no go area for me. Strictly is common parlance for Strictly Come Dancing and Louise is Louise Redknapp, wife of footballer Jamie Redknapp, who was Louise Nurding of Eternal and was voted 'Sexiest Woman in the World' by the readers of FHM magazine in 1998. Channel 4 has been broadcasting since 1982 and so anything you wrote before then will be incredibly outdated. The cutting edge of technology then was the brand-new Commodore 64 and the first prototypes of the Compact Disc. Well this outline had no tech as such; also it was set in a world replete with my limited understanding of the D&D type world. The idea of slayers and dragons in ancient times wouldn't require modern technology; though if I include something modern that wouldn't bother me too much as I rarely include technolgy much in my stories anyway. Sexiest woman in the world from a mag like FHM is hardly an accolade in my book; though I do know recall who she is. Vaguely anyway, as even back then I'd virtually stopped paying attention to what passed for celebrity status. Eternal I have no memory of, though I do recall she'd had some sort of music career. Back then I think I was at the height of my going to gay clubs, for a while before spending the rest of the night at a Heavy Rock club; where they played 'real'music (never was one for what was popular on the gay scene probably means I blocked her music from my brain). Louise to me will always mean Louise Brooks; of whom I have a tattoo. Tech-wise, I recall I got my first VCR in late '84/early '85 I think. I also recall seeing a small brick-sized commodore calculator in the local WH Smith's when they first started coming out. Some of my first fanfics were actually written on a PRE electronic typewriter (though the first of those; that I recall, were out by then). Belated Merry Christmas to you.